Many hospitals remain puzzled and challenged by the requirements for meaningful use quality reporting. To demonstrate the meaningful use of HIT and qualify for incentive funds under the HITECH Act, eligible hospitals are required to utilize certified EHR technology to collect and report clinical quality measures for the Centers for Medicare & Medicaid Services (CMS). Hospitals must report on 15 quality measures, a requirement that, on the surface, may not appear to be onerous. However, the reality is that even technically advanced provider organizations and their vendors are finding that compliance presents several challenges that could delay qualification. Among the most significant is ensuring that the multiple systems in place throughout a facility can aggregate the comprehensive data necessary to comply with reporting requirements. Another concern is the ability to address expanded technology and workflow enhancements. Core measures that must be reported to the CMS focus on ischemic or hemorrhagic stroke, venous thromboembolism (VTE), anticoagulation overlap therapy, platelet monitoring, and emergency department (ED) throughput. All quality measures must be reported for all patients, with zeros reported if there are no applicable patients. Hospitals are also required to attest to the use of certified EHR technology to capture the data and calculate and report the results, and to the accuracy and completeness of the numerators, denominators, and exclusions for each. The challenge is not with the measures themselves or the act of reporting them since most hospitals have been doing that for years. The issue for many will be ensuring that systems can be linked to enable comprehensive real-time collection and that the processes are in place for proper transmission to the CMS. Exacerbating the problem is that the data elements necessary for compliant reporting are often collected across multiple systems, not all of which are subject to or eligible for HITECH certification. In other cases, hospitals are using add-on modules that may not be certified to ensure they have the full functionality they need outside of meaningful use. 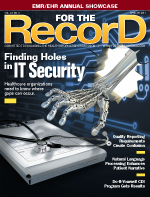 As such, providers must find ways to push data from these often-disparate systems into the certified EHR from which reports must be transmitted. The system challenges confronting Good Samaritan and other hospitals were dubbed the “hidden functional requirements” by CSC in its August 2010 report “Hospital Quality Reporting: The Hidden Requirements of Meaningful Use.” CSC deconstructed the 15 quality measures to examine the set of unique data elements required to capture the information necessary to comply with stage 1. Each data element was assigned to a source within the EHR, which incorporated core hospital applications such as registration/admission/discharge/transfer and laboratory system; specific functional requirements such as computerized physician order entry (CPOE), problem, and allergy lists; and typical inpatient EHR modules. Researchers found deceptive the appearance that quality measures would be a simple percentage calculation. Rather, each measure actually includes multiple pieces of information in the numerator and denominator to determine which patients to include and exclude and, if the recommended care was provided or desired, the outcomes achieved. For example, deconstruction of the VTE prophylaxis measure found that inclusion criteria required three data elements, exclusion required 15, and outcomes required eight. Further, the information was provided by six different sources and needed to address ED and postadmission care or care both in the acute care units and the surgical suites. The report ultimately concluded that simply meeting stage 1 functional requirements for data capture will cover only 35% of the unique data elements needed for the 15 required quality measures. The remaining data elements will come from CPOE for nonmedication orders (8%), physician documentation (29%), electronic medication administration (13%), nursing documentation (6%), discharge instructions (8%), medication list (1%), and other documentation (1%). The unexpected addition of the ED to the scope of data-capture requirements in the final rules is an excellent example of another challenge confronting hospitals: the need to add or enhance systems and/or functionality beyond the basics necessary to comply with meaningful use requirements. The ED requirement in particular is problematic because, according to figures from HIMSS Analytics, 36% of hospitals lack any ED information system. Of the 64% that do have ED systems, it is unclear whether all the necessary clinical information is captured and can be integrated with inpatient care information for reporting purposes. As a result, the requirement will force some eligible hospitals to upgrade or implement ED systems. It will also require them to reconfigure workflows and work with vendors to identify data points that, upon entry, will trigger the capture and reporting of appropriate data. Christian also points to the gaps in technology and processes that remain even after certified systems are deployed, gaps that, left unfilled, will impact a hospital’s ability to comply with reporting requirements. Specifically, while many facilities will focus first on CPOE deployment due to the attestation requirements, electronic order entry on its own is insufficient. Although the CMS has issued some clarifications to the reporting requirements, hospitals and vendors alike are calling for additional refinements to address issues that arise as compliance efforts get under way. For example, the patient demographic data requirement could be interpreted as considering data incomplete if a cause of death is not indicated. There are also data that patients can and often do refuse to provide that are required for compliance. Equally important as refining the requirements is providing hospitals and vendors with sufficient time to incorporate the changes they trigger. This is particularly true when clarifications issued after initial regulations or measure specifications require additional changes to technology and/or workflow. According to Segal, vendors and their customers have been focused on ensuring that their systems enable compliance by aligning data collected by EHRs with the specific elements or variables of individual quality measures included in the final rules. When clarifications issued by the CMS impact that alignment, vendors must reconfigure systems and hospitals must redo workflow planning. Further, midstream changes with no accommodations in the compliance time frame cut into the ability to conduct comprehensive validity testing before systems or upgrades are rolled out for meaningful use. For eligible professionals (EPs), meaningful use rules require reporting on three core and three non-core measures. If the denominator for any of the three core measures, composed of hypertension, preventive care, and adult weight screening and monitoring, is zero, EPs must also report on an alternate core measure. Conversely, a zero denominator for a non-core measure is acceptable provided the EP does not have an applicable population. Meeting these requirements presents several unique challenges for physician groups. In particular, “Eligible professionals may need new workflows for consistent capture of data defined in a particular way. The actual calculation of the measures is straightforward, but it’s making sure you have the right data associated with the right elements of the measures [that is challenging]. If it’s a practice that has been doing quality measures for a while, it will be ahead of the game,” says Mark Segal, PhD, vice president of government and industry affairs for GE Healthcare IT. Another make-or-break issue for physician practices is gaining physician buy-in. It’s a challenge faced even by those already operating in a primarily electronic environment or that have been participating in quality reporting programs like the Physician Quality Reporting Initiative, according to Sandra Regenye, billing and operations manager for Horizon Eye Care, a 10-physician ophthalmology practice in New Jersey that has been utilizing the NextGen Ambulatory EHR since 2001. She notes that Horizon will soon file for its incentive funds, something that is possible so early primarily because it secured top-down support for its meaningful use strategy. Regenye recommends that practices designate a team to take responsibility for assessing what will be needed to meet reporting requirements, including gaining any clarification necessary for compliance. In Horizon’s case, the team was able to tap into NextGen Healthcare’s meaningful use support group to answer many of its questions. They also participated in webinars and Centers for Medicare & Medicaid Services events designed to educate providers on achieving meaningful use. This information was used to educate practice executives and physicians on what was required and the benefits of doing so as well as for designing and implementing its strategy for complying with reporting requirements. One challenge Horizon doesn’t face, compared with others, is managing reporting when data are collected in more than one system or when data aren’t collected at all regardless of how many systems are in use.